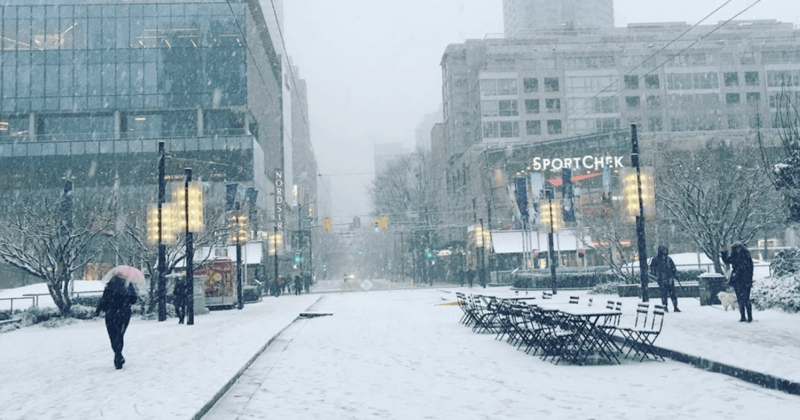 Snow is finally flying in Metro Vancouver but the question is — how long will it stick around? The weekend snowfall comes as the result of a low-pressure system that’s developing over the province. Vancouver Island, specifically Lake Cowichan, is expected to receive the most snowfall over the next 24 hours. Affected areas of Metro Vancouver will receive anywhere between 5 to 10 cm of snowfall through the evening. The weather agency reminds drivers to adjust their driving to the changing road conditions. Should visibility be reduced, be sure to slow down, watch for tail lights ahead, and be prepared to stop. Update: Environment Canada has updated its snowfall warning noting that up to 7 cm of accumulation has hit the Lower Mainland so far. An additional 5 cm is expected for parts of southern Metro Vancouver over the course of this evening.